Chain now features four locations in the Pine Tree State. Vinal Doody and Scoop in Scarborough, ME. We are very excited for this opportunity to offer a family friendly environment and the ability to give back to the community. sweetFrog Enterprises, LLC.is pleased to announce the reopening of its Gallery Boulevard location in Scarborough. The Gallery Boulevard location is the fourth sweetFrog store operating in the Pine Tree State. sweetFrog offers a wide selection of frozen yogurt flavors, along with fresh topping choices and a self-serve model. The premium frozen yogurt chain was recently named Best in the US by The Daily Meal. “We are very excited for this opportunity to offer a family friendly environment and the ability to give back to the community through fund raising events for local sports teams, churches and other not-for profit entities,” said Vinal Doody, owner and former partner in a local accounting firm,. The store, located at 300 Gallery Boulevard, Scarborough, Maine 04074 will begin opening festivities on May 13, to include free youth t-shirts to the first 50 guests Friday and their Grand Opening is on May 14th and 15th . The grand opening celebration will feature stickers and sweetFrog wristbands with appearances by the ever-popular sweetFrog mascots, Scoop and Cookie. The first 100 guest purchases will receive free youth t-shirts and every purchase comes with a return-visit BOGO card. In addition, guests can get their frozen yogurt free if they can guess the weight of their cup of yogurt and there will be a drawing for one lucky guest to win free FROYO every week for a year. 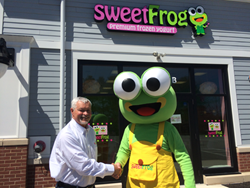 "Our goal is to be a strong community partner in Scarborough and the greater Portland community; and whether it’s a birthday, a fundraiser, or a special night out, we want sweetFrog to be THE PLACE our friends in Southern Maine choose to gather and enjoy a sweet treat," said Patrick Galleher, sweetFrog CEO. The celebration will not stop after the grand opening. From May 16 through Memorial Day, sweetFrog will share our appreciation with the local community by offering medical professionals, schools, fire and rescue, local businesses and churches with 50% off purchases on their designated day. In addition, there will be a 50% donation of sales to non-profit organizations who book benefit nights by June 1st, 2016. Sweet Frog (http://www.sweetfrog.com) is the fastest growing premium, all natural, self-serve frozen yogurt restaurant company in the country. Sweet Frog currently has 340 stores including both company-owned, franchise and independently licensed locations either open or under contract in twenty-four states in the U.S, Dominican Republic, United Kingdom and Egypt. The company was founded in 2009 and is based in Richmond, Virginia. Sweet Frog prides itself on providing a family-friendly environment where customers can enjoy soft-serve frozen yogurt, gelato and sorbets with the toppings of their choice. The company was founded on Christian principles and seeks to bring happiness and a positive attitude into the lives of the communities it calls home.